Introducing the Dent Act. 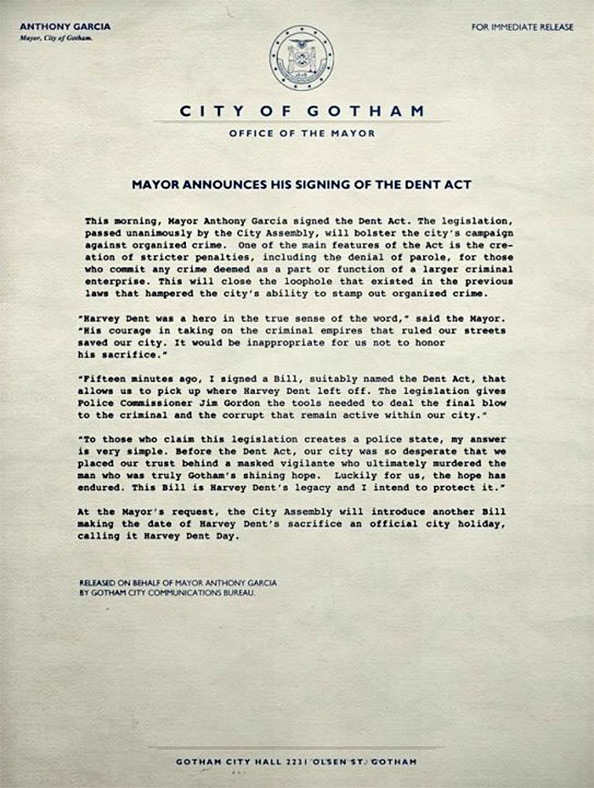 While this isn't much of a viral, there was an authentic-looking City of Gotham document found on the DewGothamCity.com website, found via SuperHeroHype, mentioning the Dent Act. As we all know, Harvey Dent didn't make it past The Dark Knight, and we see his funeral in one of the first trailers. So, in the world of The Dark Knight Rises, the city introduced the "Dent Act" in his name to "bolster the city's campaign against organized crime." The document outlines some plans, and includes a good quote by Gotham Mayor Anthony Garcia. "This Bill is Harvey Dent's legacy and I intend to protect it." See below! Any idea what this ties into, or is it just a piece of TDKR's world shown early? Hope we get more clues soon. I totally want to believe that too. OK, so a man in a bat suit and a girl can tumble-fall together from a penthouse (and crash-land onto a car, no less) and survive; but rickety ol' noodle-neck Dent falls two stories and is out of commission for good? Now THAT'S a dream within a dream. Well he wasn't in great shape to begin with, but from a story stand point would it be more interesting if he was dead or if he was locked up in arkham's basement just so they could bring in these legislations? Dent is dead and has been dead. It's written pretty plainly in TDK script. and with this, certain people will pick up on 2 or 3 references within the movie. Cool! Although I think this would've worked better as a "Gotham Gazette" article than a Mayoral Document...those fake newspapers they threw around NYC and other cities for TDK were awesome. Harvey dent is dead not two face!